Again we ventured far beyond our normal comfort blanket of the inner ring road to the dizzy distances of Sutton Coldfield, to a Best Western hotel for dinner. I know, right! Having plucked up the courage and boarded our public transport for Sutton, and our eventual destination of Moor Hall Hotel & Spa, we were given some mixed feedback from some of our friends and followers on Twitter. It appears to be a venue that some have loved and some have hated in the past. Moor Hall is a 4 star Best Western Premier property. On the approach I did wonder about the route our local friends took us. 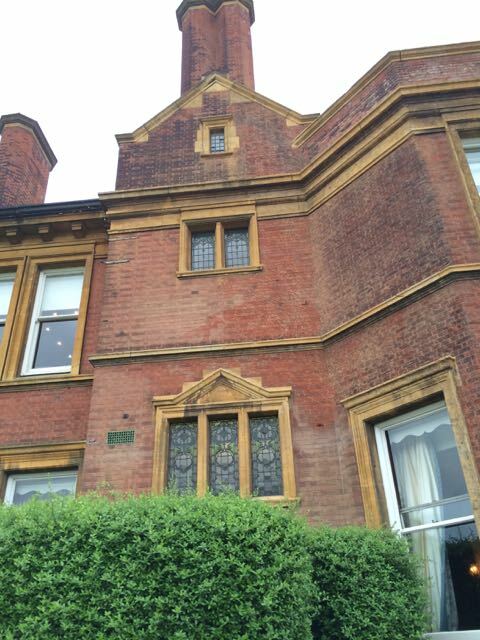 After a few suburban roads, a short-cut down a cul-de-sac, and a wander past the golf club we came across what is in fact a rather splendid looking country house dating from 1905 (the current version, the earliest records show a Moor Hall on the site in the 15th century). We were dining with friends for a long overdue catch up and decided to make the most of the weather and opt for the more informal dining option on the terrace, with lovely views of the golf course. There are several restaurants in the hotel with different menus, so do check out the website to understand what they offer. For starters we tried the Ham hock terrine with crispy smoked Brie & apple, and the Potted crab with dill butter and cider bread. 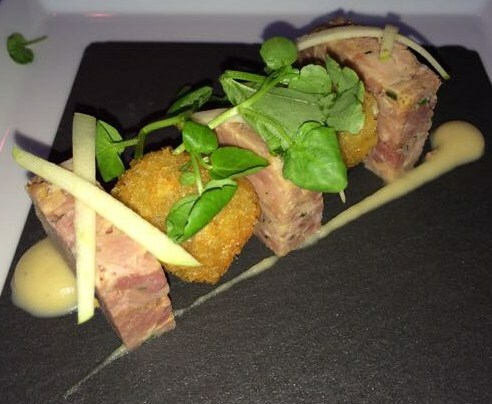 The ham hock was prettily presented with three generous slices of ham sandwiching two crispy melt-in-the-middle breaded balls of smoked brie accompanied by apple puree, slithers of fresh apple and pea shoots. A combination that worked really well. We also tried the potted crab, which was cool and tasty and served with crisp bread. We are not massive fans of theatrical dining options, I’ve complained many times about food served on roofing products and chopping boards. This time however, after a tip off from Birmingham dining twiteratti @richardpope (you probably know him, everyone does), we opted for main courses served on sizzling slabs of hot volcanic rock. 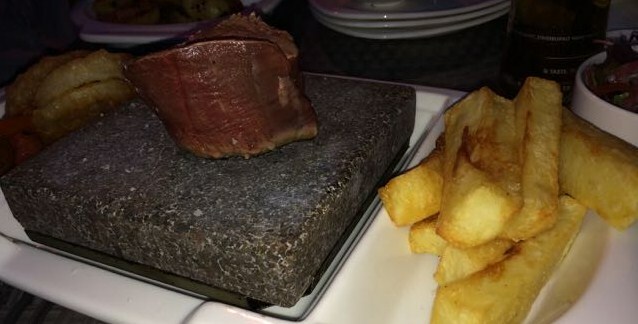 The premise of the “Hot Rocks Menu” is that the food is brought to you uncooked, alongside an extremely hot rock, and that you cook it yourself on the rock. The best steak I ever had was in a tiny Portuguese village on a hot rock, so I had high expectations. We ordered a variety of main courses, including fillet of local beef, tuna steak, and halloumi with sweet pepper skewers. The beef fillet was juicy, and the experience of cooking it just-so was as delightful as I found it in Moncarapacho. The beef was served with Portobello mushrooms, beautiful heritage tomatoes, and crisp onion rings. We also had hand-cut chips which were served perfectly Armadillo – soft on the inside, crispy on the outside, Armadillo! All of the hot rock dishes come with a garden side salad and a choice of new potatoes, hand cut chips or sauteed potatoes with shallots and bacon. All were good. The tuna steak and the halloumi mains went down a treat too. In fact we couldn’t fault the food. We rounded off the meal with a tasty Amaretto torte with coke sorbet. 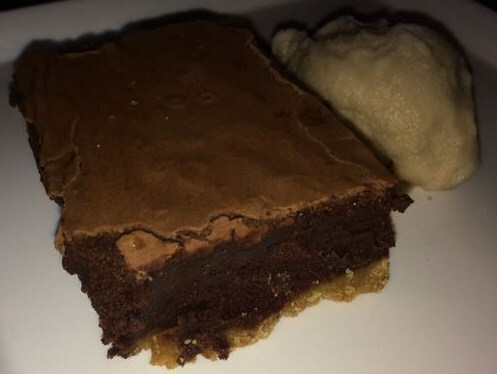 I did have my doubts about how well this would be executed but I can say the warm and tasty tart was well received with a crisp top layer and moist succulent middle which went well with the coke sorbet. (I apologise for the poor quality photos but it was getting dark outside by this point of the night). This entry was posted in Area: Out of Birmingham, Cuisine: English, Cuisine: Modern Mixed, Price: Average, Venue type: Restaurant and tagged Birmingham Restaurant, birmingham restaurant review, birmingham review, eating out in birmingham, Out In Birmingham, out in brum, OutInBrum, restaurant review, where to eat in birmingham, Where To Go In Birmingham, where to go out in birmingham. Bookmark the permalink.